A New Map of Turky in Europe And Parts adjoyning Shewing their Principal Divisions and chiefe Cities, Towns, Rivers, Mountains etc. Dedicated to his Highness William Duke of Glocester. 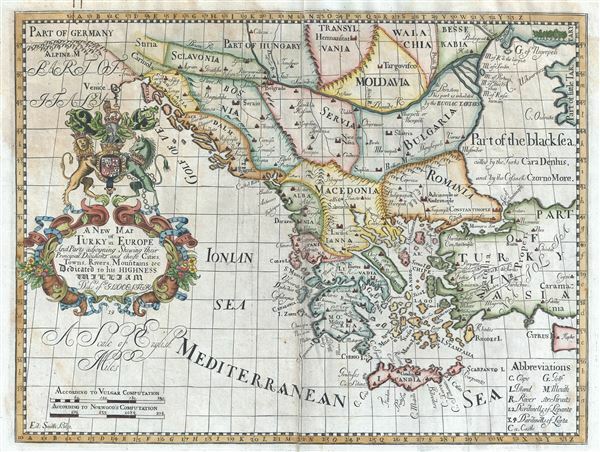 This is an attractive 1712 map of Greece, the Balkans, Macedonia and Turkey in Europe by Edward Wells of Oxford. Centered on modern day Greece, it covers from Transylvania and Hungary to Crete and the Mediterranean and from Venice east as far as Cyprus, inclusive of modern day Greece, Bulgaria, Romania, Macedonia, Albania, Serbia, Bosnia and Herzegovina, Montenegro, Croatia, Slovenia and Moldova. The Greek Isles are well represented. It notes towns, islands, rivers, capes, and a host of other topographical features. The map depicts the region when most of Greece and the Balkans were under the control of the Ottoman Turks. A decorative cartouche appears on the left of the map featuring the coat of arms of the Duke of Gloucester. This, like many other Wells maps, is dedicated to Prince William, Duke of Gloucester and son of Queen Anne, who, when this map was being prepared, was a student at Oxford. Engraved by Smith and published by T. Bonwicke for the 1712 edition of Edward Wells' Atlas, A New Sett of Maps both of Ancient and Present Geography. Very good. Some wear and spotting along original centerfold. Some foxing in top left quadrant. Original platemark visible. Professionally flattened and backed with archival tissue.